Gusoku brass incense stand. 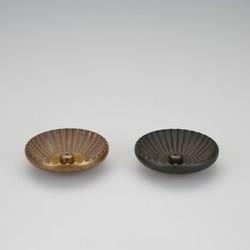 This piece is manufactured using traditional casting techniques, in Toyama, Japan. Stunning design by Yuka Arii. Available in two colours, Brown/Black and Gold/Brown. Height 20 mm x 78 mm diameter. Care: Wipe with a soft damp sponge and diluted detergent to clean. Do not use metal polishing creams. The incense stand has a colour fixing finish, but the colour may fade slightly over time. Warm up any molten wax to remove it without damaging incense stand.